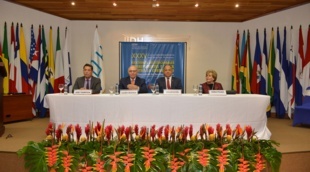 On Aug. 22, 2017, Professor and Dean Emeritus Claudio Grossman opened the Annual Course of the Inter-American Institute of Human Rights in San Jose, Costa Rica. 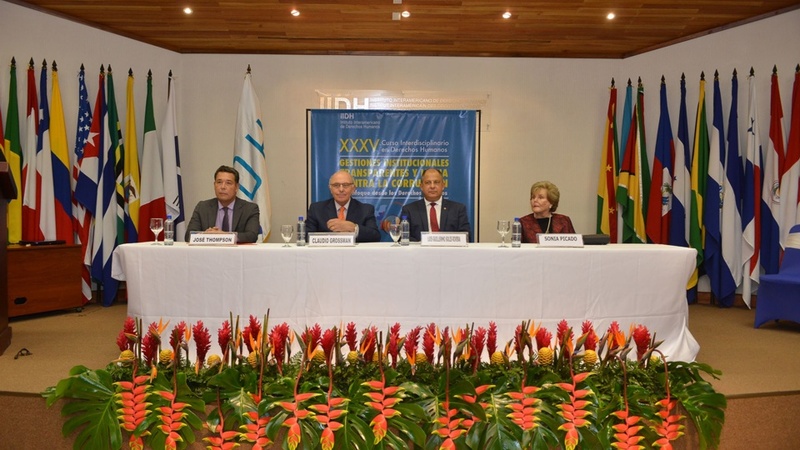 The President of Costa Rica Luis Guillermo Solis joined in the opening ceremony, which was attended by 200 participants in the course, including academics, journalists, diplomats, civil servants, and members of non-governmental organizations. This year’s course topic was Transparency and the Struggle against Corruption. See more about the annual institute at http://iidh.ed.cr/. Grossman, renowned for his expertise in international law and human rights, currently serves as president of the Inter-American Institute of Human Rights, a member of the United Nations International Law Commission, is a member of the board of the ABA’s Rule of Law Initiative (ROLI). This fall he will teach the Torture Prohibition in International Law practicum, a structured experiential learning opportunity where students are responsible, under the guidance of faculty, for providing strategic advice to the United Nations Committee against Torture (where he served as Chair from 2008-2015).